Do you have trouble with how to eat healthy while travelling? It is that time of year when many women pack their bikini, the beautiful towel they got for Christmas and that book they’ve been meaning to read. They head to the beach to soak up some sun, sip a mojito (sugar-free of course) and catch up on some well-deserved rest and relaxation. Perhaps this isn’t your reality and instead, you are planning a business trip or something in the colder climates maybe. This year we, as a family, are heading to New Zealand to discover some of the beautiful rugged countryside. I don’t see a bikini being part of what I pack but the book and mojito are definitely in my future. No matter where you’re going, I am sure you will appreciate these quick, easy and healthy ideas for organizing what you will eat while you are away. These ideas will help you plan what to take and what to purchase once you get to your destination so you can stay on track with your health regime. While these tips can all be used right here at home, they become even more important when you’re travelling. Traveling can throw your regular healthy habits off when you’re skipping time zones and changing your usual daily routine. As a health coach, I have such a sense of pride when my clients skip junky convenience foods in favour of foods that will sustain their energy and feed their gut. Pro Tip: When booking your hotel room, ask if you can have one with a mini-fridge. This will help you store some of your healthy snacks and groceries while you’re there. Planning ahead of time and organizing your own healthy snacks to bring will keep you from getting to a state when you will just buy and eat anything because the horse in the paddock you just drove past was looking super tasty. These snacks will hold you off until you can purchase what you need at the local grocery store. If you’re going to have a cooler or eat them within a couple of hours, boiled eggs are a great go to, also your own homemade protein balls. I make a heap to have as a snack with coffee while we are away. You don’t need to know anything about cooking to be able to make these oh and by the way don’t forget the ice packs. Unsalted nuts and seeds (I love walnuts and pumpkin seeds myself). Any health or protein bar of your choice that does not contain maltitol and is sweetened with stevia or erythritol. Sliced veggies (carrots, celery, cucumber, broccoli, etc.) with a dip (hummus, guacamole, salad dressing, etc.). You can even buy single-serving packs at Costco. Good quality granola cereal without the added sugar or make your own. Savory snacks like roasted chickpeas. High-quality protein powder to make your own smoothies or make your own. Be sure to also pack a mini blender, like a Magic Bullet, or stab blender if needed. And don’t forget your drinks. Bring some water with you. Or if you’re flying, choose water in the airport and on the plane. Of course, you can always Google your destination and search for grocery stores or healthy restaurants. But there are a couple of websites and apps that may be helpful for you. Nuts and seeds that you can use separately as a snack or combine into a DIY cereal. Berries, fresh or frozen depending on your food storage capabilities. These work well with some yoghurt for a dessert or on your cereal. Nut butter. Great to put on that slice of apple or celery or perhaps you have been lucky enough to find some grain-free crackers. Ingredients to make 1-minute muffins. I buy them all separately then mix them into a plastic bag to have on hand for when I need them. Most rooms include a microwave in which you can make yourself a muffin to have on the go. I always travel with a couple of microwave-safe containers in which I can make muffins to fill and take for lunches or to have as a snack along the way. Almond or your choice of healthy milk to have with your cereal, in your muffins and with your drinks. Salad packs to have for lunch. Ditch the dressing. 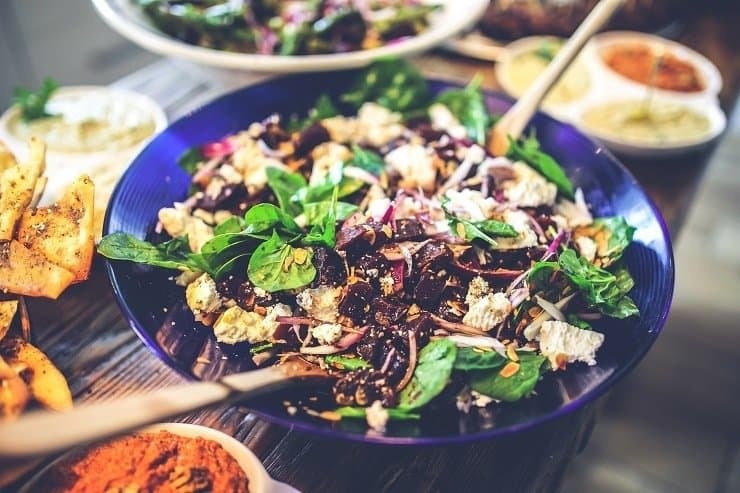 Olive oil, lemon juice and salt and pepper to give you the ability to dress your own salads. Dark chocolate, at least 85% for that treat to have with your coffee. Your choice of healthy sweetener if you need it, maybe stevia or xylitol. Eggs, great for that quick microwave omelette in a mug. Whole chicken to have for sandwich muffins or a salad. Some of these choices may seem extreme but in reality, take the stress of what your next snack or meal will be. It only takes an hour or two out of your first day to shop and prep and you will rest in the knowledge that you can eat healthy for the rest of the trip. Of course, depending on how long you are away for some of these options may not be suitable but pick and choose according to your plans. Travelling can make it difficult for you to continue with your regular diet and can derail your healthy lifestyle. Planning ahead and being prepared is simple, and will keep your health goals on track even when you’re out and about, leaving you to enjoy your holiday safe in the knowledge that you are doing the best for your body.